Rated up to 15A 250V. Rated up to 15A 125V. 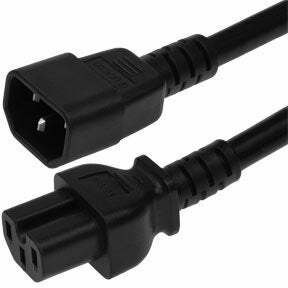 The IEC C15 power cord receptacle is commonly used in data center and kitchen appliance environments because most connectors carry a maximum pin temperature of 70 degrees C but the IEC 60320 C15 carries a maximum pin temperature of 120 degrees C. The IEC C15 is perfect for applications such as connecting servers to power distribution Units (PDUs) and small appliances like electric kettles and griddles. The IEC C15 products have the same pin dimensions and layout as the IEC C13 but the bottom area is notched. All the products are RoHS compliant, environment friendly and available at very reasonable prices. Manufactured by ISO 9001 - 2000 registered manufacturers speaks for the quality and safety of the product.